Powerflex Purple Road Series Bushes. Diagram Position 1 : Front Wishbone Front Bush PFF80-801 (Quantity 2) Diagram Position 2 : Front Wishbone Rear Bush PFF80-802 (Quantity 2) Diagram Position 3 : Front Lower Engine Mount Insert Kit PFF80-810 (Quantity 1) Diagram Position 4 : Front Anti Roll Bar Mounting Bush 18mm, 20mm or 22mm. Diagram Position 5 : Rear Beam Mounting 60mm Bush PFR80-815 (Quantity 2) Diagram Position 21 : Gearbox Mount Insert. PFF80-1321 (Quantity 1) Diagram 22 : Upper Right Engine Mounting Insert PFF80-1323 (Quantity 1) ALSO INCLUDED : PowerAlign Camber Bolt Kit (12mm). PFA100-12 (Quantity 1) Special Product Notes. PFF80-810 is an insert for the original mount, it is not a full replacement bush. It is designed to fit OE part number 90575190 as fitted to the Z20LET Turbo 16v and Z22SE 16v engines. It will not fit vehicles fitted with automatic transmission. If fitting to any other engine, please check that our bush and the voiding on the original bush match. PFF80-1321 Fits SRi/GSi models with 2.0 turbo petrol engines, engine codes Z20LET. PFF80-1323 fits 2.0 turbo engine Z20LET including SRi/GSi and 2.2 litre petrol engine Z22SE only. PFF80-1321, PFF80-1322 & PFF80-1323 are inserts which fit into the voids on the original mount. It is not a full replacement bush. Why choose Powerflex Polyurethane Suspension Bushes? Time to do the sums.. Polyurethane has been with us as a specialised plastic for some thirty years. However recent advances have now made it possible to engineer very special properties into this exciting material. Suspension bushes are some of the most highly stressed components fitted to a motor car. They undergo enormous strains and in the most arduous of conditions with no maintenance or lubrication. The material they are manufactured from is a rubber compound containing natural products which deteriorate with age. It becomes softer and more pliable, resisting the forces placed on it less and less. 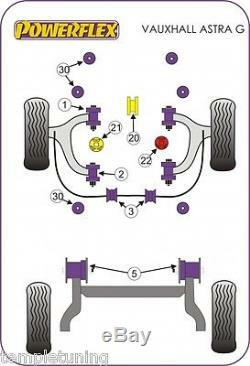 Therefore allowing more and more movement of suspension components and offering less and less control over the suspension geometry. This is the single biggest reason you can instantly tell the difference driving a three year old car compared to a showroom new one. However even new cars will benefit from POWERFLEX bushes because of their superior design they offer much more effective control of the suspension components to a much greater extent than normal rubber items. POWERFLEX for prolonged tyre life. With the technological advances in this material it has been possible to overcome the common problem associated with harder bushes which is increased noise. By correctly engineering the polyurethane compound, bushes can be made 25-30% stiffer than new rubber items but with exactly the same noise absorbing properties. WHY CHOOSE TEMPLE TUNING LTD? Leading suppliers of Powerflex Bushes. Vat Registration No: GB 891142328. We are registered with Companies House and VAT registered. We have been supplying car parts to both public and trade since 2004 making us one of the longest serving internet providers. Shopping with us is safe, easy and reliable. Some Powerflex bushes are special order items. The item "Vauxhall Astra MK4 G 98-04 SRi, GSi Z20LET 2.0 T Powerflex Suspension Bush Kit" is in sale since Tuesday, January 19, 2016. This item is in the category "Vehicle Parts & Accessories\Car Tuning & Styling\Performance Suspension\Other Performance Suspension". The seller is "templetuning" and is located in Bristol. This item can be shipped to all countries in Europe.